Elections are important. Will the elected individual perform according to the oath of office? Or will he or she avoid constitutional restraints and hope voters won’t realize the betrayal? Image from League of Women Voters of California Flickr, some rights reserved. Our nation’s founders strongly believed that voting in any election for a federal post should be limited. Not everyone should vote, and limitations about who will cast a ballot should be set, not by the national government but by each state. With a few exceptions, states would decide not only who would vote but also when voting day would occur. For many years, Maine’s voters cast their ballots in September, a practice later changed to conform with the rest of the country. Over the years, several amendments to the Constitution removed many other original restrictions. Amendment XV (1913) banned denying the privilege of voting because of “race, color, or previous condition of servitude.” Amendment XIX (1920) gave women the right to vote. Amendment XXIV (1964) said no eligible voter could be denied a ballot for not paying a poll tax. And Amendment XXVI (1971) lowered the voting age to 18. These changes were properly enacted via amendments to the Constitution, not by any law or presidential executive order. In recent years, however, the federal government has broadened its dominance over the setting of voter qualifications without relying on the amendment process. Judicial power has also been used to set new rules, even cancelling voter requirements that are logical and, in this writer’s view, very much needed. Some require would-be voters to produce photo identification before being given a ballot. Objections arose over this rather simple and sensible test because, it has been claimed, requiring a photo ID is costly for some and an inconvenience for others. As in many other instances, the charge of racism was used to foster change. It helped to convince a Texas judge and the Fifth Circuit Court of Appeals that the Texas requirement for a photo ID must be abolished because it violated the 1965 Voting Rights Act. The Texas law and similar laws in other states seeking to protect the voting process from fraud were erased. Yet, a person has to show a photo ID to board an airplane or cash a check. Shouldn’t there be that kind of requirement for voting? Shortly after the 1787 Constitution had been written and was being considered by the states for ratification, John Marshall (who became Chief Justice of the Supreme Court from 1801 to 1835) addressed the potential for judicial abuse during the Virginia’s ratifying discussions. He explained, “Congress is empowered to make exceptions to the appellate jurisdiction, as to law and fact, of the Supreme Court. These exceptions certainly go as far as the legislature may think proper for the interest and liberty of the people.” Marshall obviously believed that Congress would, when necessary, use its constitutionally authorized power to keep the Supreme Court and any lower federal courts from overreaching. Congress should use its Article III power to stop judicial meddling. Let the states decide via the Tenth Amendment what a would-be voter must provide before being given a ballot. Image by Donald Trump August 19, 2015 (cropped).jpg: BU Rob13 Hillary Clinton by Gage Skidmore 2.jpg: Gage [GFDL or CC BY-SA 4.0], via Wikimedia Commons. That she would use the word “assassinated” in the context in which she delivered it remains an amazing bit of political history. We bring it up because it has largely been deposited in a memory hole. In 2008, was she suggesting that someone might (or should?) attack candidate Obama? Was she hoping that her use of that word might stimulate some crazy to duplicate what had happened to Senator Kennedy sixteen years earlier? Mere mentioning the possibility of an assassination during a political campaign constitutes a dramatic departure from legitimate political discourse. And the reporters who heard her comment, or heard about it later, should have emblazoned it on the minds of all. But most didn’t. Hoping that no one remembers her 2008 use of such an inflammatory word, Mrs. Clinton has chosen to imply that Donald Trump’s recent comment about her selection of possible candidates for the Supreme Court invited violence, the very tactic she had employed in 2008. But Mrs. Clinton speedily accused Trump of what she should have been accused of in 2008. She pontificated, “Words matter, my friends. And if you are running to be president, or you are president of the United States, words can have tremendous consequences.” Correct! Which is precisely why the media should have excoriated her in 2008, and why her recent attack on Trump for something that had no mention of the kind of possibly deadly suggestion contained in the word “assassinated” is mountainous hypocrisy. In 2008, she not only wasn’t held accountable for possibly inciting a monstrous crime, she repeated her remarks a few weeks later. Only days after her first use of the word “assassinated,” Richard Stengel, the managing editor of TIME, interviewed Hillary. Having had no repercussions from her first use of the explosive word, she repeated it: “I think people have short memories. Primary contests used to last a lot longer. We all remember the great tragedy of Bobby Kennedy being assassinated in June in Los Angeles.” Was that another attempt to plant the idea of assassination in the minds of some potential killer? It certainly seems so. Did the main stream media hold her accountable? With rare exceptions, its supposedly hard-nosed reporters and commentators ignored her second outrageous use of the term. All during their rise to prominence, the two Clintons have benefited from a standard that few have ever enjoyed. Others have to submit to strict rules and temperate conduct while Hillary and Bill are given a pass. Hillary obviously knows that explosive words can lead to explosive actions, which is why she attacked Trump’s statement. If she were held to the standard she has set for Donald Trump, she would long ago have become a political has-been. New Yorker Magazine is hardly a bastion of right-wing politics. Instead, it can usually be found promoting causes championed by liberals, left-wingers, and elitists. Its veteran political writer went to several Trump rallies to find out for himself what motivates anyone to support the New York City mogul. Before reading the New Yorker article, I received a report claiming that it provided more than two dozen reasons why some people like Donald Trump and want him for president. But then I read the article and found it to be anything but a pro-Trump piece. It does mention a few reasons why some Americans stand firmly in the Trump camp. But a politically on-the-fence American who reads it would likely be driven away from supporting Trump. He might end up voting for Trump’s opponent or decide not to vote at all. 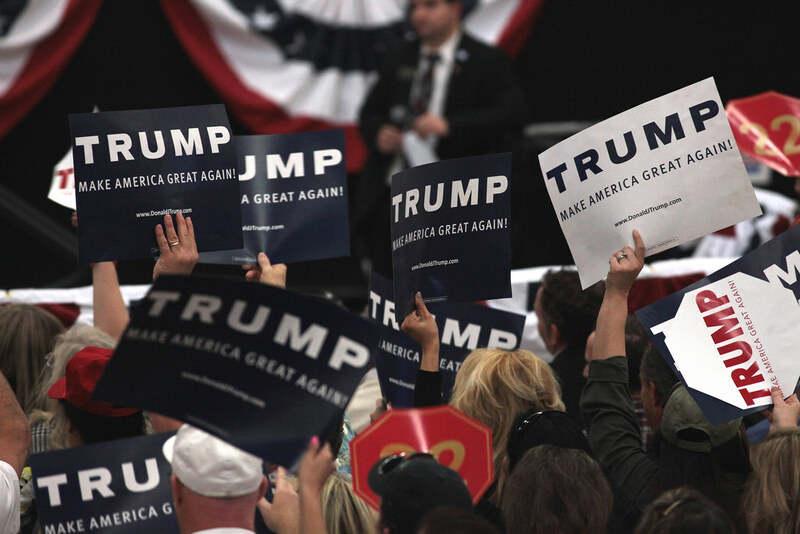 The report I received – not the article itself– stated that Trump supporters “have had it with” an array of anti-Establishment politicians and policies. There’s nothing sensationally new about that. Its list of reasons is impressive, and they smack of accuracy. It says “Trumpies” are rebelling against anyone named Bush or Clinton, and against political correctness, illegal immigration, welfare waste and fraud, ObamaCare, Federal Reserve money-printing schemes, Barack Obama’s golf, Holiday – not Christmas – trees, global warming nonsense, gun confiscation threats, cop killers, stagnant wages, boys in the girls bathrooms, and more. My own survey assures me that all of that is a correct reading of any Trump supporter. However, George Saunders who wrote the lengthy piece in New Yorker can hardly be described as an admirer of either Trump or the many Trump supporters he encountered and interviewed as he traveled across the country. On the other hand, the writer of the report (no name was provided) went far overboard in attributing any sort of pro-Trumpism to what Saunders provided. With more than two months still remaining before Americans vote for the next president, plenty can happen to sway the yet undecided, maybe even move some from one camp to the other. We hope all will base their decision on facts, not on hit pieces or wild characterizations of any candidate. The two articles mentioned above did agree in one main point. It is that most Americans are tired of promises not being kept by Democrats or Republicans, of changes in the nation’s culture and moral standards, of being given half-truths and lies when honesty remains the best policy, and of sensing that the country is being changed – not for the better but for the betterment of an arrogant well-entrenched few. But another lesson reinforced from reading the magazine article and the ensuing report convinces me that checking the original is far and away the wiser course. Relying on someone’s view of something may take you far from what it really said. On July 15th, the government Turkey survived a coup attempt that sought to unseat President Recep Tayyip Erdogan. As a member of both the United Nations and NATO, an ally in the conflict seeking to defeat ISIS, and with a bid for acceptance into the European Union on the table, faraway Turkey became an instant concern to the West. The unrest especially drew attention because of Turkey’s proximity to the land currently possessed by the Islamic caliphate ISIS. The government Turkey survived a coup attempt that sought to unseat President Recep Tayyip Erdogan, pictured above. (Image by Government of Chile [CC BY 3.0 cl], via Wikimedia Commons). What happened in Turkey clearly stems from its early 20th century moves away from militant Islamism. For 600 years, the Islamic Ottoman Empire ruled the region from which it launched several attempts to conquer Europe. Perhaps the most famous of these was the naval battle at Lepanto in 1571 when an outnumbered fleet of Europeans defeated the Islamic foe. Other forays by Islamic forces met defeat at Vienna and Belgrade. This series of setbacks led to several centuries of a most welcome live-and-let-live policy by the Islamic world. After World War I, in which Turkey participated, a more modernized nation began to take shape. Determined Islamists bristled under the leadership of Mustafa Kamal Ataturk, who became Turkey’s leader in 1923. The term “Ataturk,” meaning father of Turkey, is an addition to the name of the country’s leader who is greatly revered by more secular Turkish Islamists. A Muslim himself, Ataturk relaxed but didn’t destroy the Islamic hold on the nation. His rule had always angered some who resented the acceptance of numerous Western ideas and values for their country. In 2014, a more determined follower of Islam, Recep Tayyip Erdogan, won election as the nation’s president. The July 15th coup, led by those who preferred Ataturk’s ways, sought to erase numerous trends and revisions in Turkish life. But quick action by Erdogan and his followers overwhelmed the less militant Muslims in the military and many other posts within the nation. In a matter of days, Erdogan’s followers accomplished firing 9,000 police officers and 21,000 educators. They suspended 21,000 schoolteachers and either detained or suspended 10,000 soldiers, 2,700 judges and lawyers, 1,500 university deans, and 1,500 of the government’s finance officials. Added to this upheaval, the government shut down more than 100 electronic and print media outlets and instituted censorship over other suspected adversaries of the government. President Erdogan had quickly demonstrated his determination to reemphasize Islamic practices as he put an emphatic stop to the modernization of the past century. Turkish officials blamed the attempted coup on Fethullah Gulen, a Turkish Islamic cleric who has lived in self-imposed exile in the United States for the past 15 years. The Erdogan government calls his followers in Turkey the Gulenist Terror Organization (FETO). Gulen has emphatically denied having any role in the failed coup, but the Erdogan government has demanded his extradition from America. He remains – for now – at his home in Pennsylvania. Meanwhile, the Turkish government has enraged secular Turks by canceling some celebrations honoring Ataturk while commemorating past Ottoman victories and celebrating the birthday of Mohammed. It seems completely correct to believe that Turkish Islamists led by President Erdogan have gained more power because of the incident and their success in quashing it. Erdogan has reached out to some of his adversaries in hopes of calming fears, but Turks who wanted modernization – and they include freedom from some of the Islamic-style strictures seen in Saudi Arabia and elsewhere – are the losers. Will there be more unrest generated by those who want a return to Ataturk’s ways? Only, time will tell. But Turkey is now in the hands of a more regimented government that has gained more power by severely putting down the forces behind the failed coup. Last January, the Obama administration quietly airlifted $400 million in foreign currency to Iran. An unmarked cargo plane delivered the funds and the completion of the deal just happened to occur on the same day the Tehran regime released four Americans previously imprisoned for a variety of charges. The suspiciously unmarked plane also delivered part of a $1.3 billion payment for Iranian funds held in the U.S. ever since the Iranian hostage crisis of 1979-1981. The transaction certainly smelled like a ransom payment, something President Obama and his press corps have vociferously denied. But the incident brought back memories of the 1979-1981 hostage crisis when America suffered unneeded indignity and unnecessary loss of life. Two American hostages being detained in Iran after the siege of the American embassy, 1979 (image by an unknown author [public domain or CC BY-SA 4.0], via Wikimedia Commons). The CIA organized and directed a coup that helped to keep the pro-American Shah Reza Pahlavi in power in 1953, an entangling alliance that our founders warned us about. Yet, American and British policymakers turned on him in the mid-1970s. On November 4, 1979, 66 American diplomats and embassy workers were captured when a mob of student demonstrators stormed the U.S. embassy. Hoping to show their solidarity for “oppressed minorities” and Islam’s “special treatment of women,” the leaders of the assault immediately freed 13 women and African-Americans. Another male embassy worker with health problems was released. The remaining 52 were held hostage for 444 days. The Iranian students were egged on by anti-American fervor in the wake of Iran’s ouster of pro-American Shah Reza Pahlavi and the return to the country of anti-American Ayatollah Ruhollah Khomeini. The students then turned over their captives to Iranian authorities while celebrating their success. Many of these hostages endured beatings, solitary confinement and threats of execution. The detainment for most was ghastly. President Carter meekly denounced the seizure of our embassy and the confinement of U.S. citizens, appealing for their release on humanitarian grounds. Initially, the Iranians intended to hold the embassy and its occupants for only a short time. But Khomeini, now the de facto political leader of his country, found the insult given to the United States a source of pride and a blow at the “Great Satan.” He proclaimed, “This has united our people. Our opponents do not dare act against us.” The response of the Carter administration to the outrage was pitiful. Something else happened during the early days of this crisis that few recall or wish to mention. Approximately two weeks after the seizure of the embassy, Khomeini announced his intention to withdraw Iran’s millions from New York banks. Only then, not when our embassy was seized and our people imprisoned, did President Carter declare a state of emergency and freeze Iranian assets. The taking of our embassy and the treatment accorded its personnel weren’t reasons enough to merit an emergency declaration. But the threat of sizable withdrawals from the big banks had to be countered. On April 24, 1980, President Carter sent a pair of helicopters on an ill-fated rescue mission. Flying off U.S. Navy carriers in the Persian Gulf, the copter mission proved to be a complete disaster. The helicopters ran into sand storms and were destroyed. Eight American servicemen and one Iranian civilian died during the botched attempt. And Jimmy Carter’s reelection effort suffered a huge setback. On January 20, 1981, the 52 hostages came home to be greeted by a defeated Jimmy Carter during his last day in office. Though not alone as a reason for his not being reelected, the weakness of America during the hostage crisis certainly figured in the choice of many voters that previous November. Good question. America’s foreign policy has largely remained hidden from its citizens, interfering time and again in the governing of other countries for its own gain. It’s time our foreign policy return to the advice of our founders to regain its former level of prominence and respect around the globe. Raising money when running for political office is important. But gaining support from a majority of voters in any election contest is more important. And spending lots of money doesn’t necessarily bring victory. During the early months of the 2016 Republican contests for the GOP’s presidential nomination, former Florida Governor Jeb Bush spent far and away the most money of all the candidates. (Photo by Gage Skidmore from Peoria, AZ, United States of America (Jeb Bush) [CC BY-SA 2.0], via Wikimedia Commons). During the early months of the 2016 Republican contests for the GOP’s presidential nomination, former Florida Governor Jeb Bush spent far and away the most money of all the candidates. According to The Washington Post, he shoveled out $338 million in the first three contests. After finishing sixth, fourth, and fourth in Iowa, New Hampshire, and South Carolina, respectively, Bush pulled out of the race. The Bush spending spree gained a mere 92,000 votes in those three contests. Each of the votes he won, therefore, cost him $368, an amount far more than that spent by his opponents. Those lavish expenditures didn’t even include the $100 million Super PAC money Bush raised via the Right To Rise committee. After only a few months, its coffers had shrunk by 85 percent. Bush abandoned the race on February 20. Additional figures supplied by the Post showed that Ted Cruz spent $193 for the each of the 244,000 votes he received during those early contests. Marco Rubio dished out $153 for each of the 234,000 votes he gained. And John Kasich spent $72 for every one of the 101,000 votes he garnered. These three also gained more votes and spent less money than did Bush in those beginning races. But they, too, failed to achieve ultimate victory. The voter’s choice in the early contests – and in many more that came later – was Donald Trump. He became the official Republican Party nominee during the July GOP convention. But in the three early races noted above, he spent a relatively paltry $64 for each of the 374,000 votes he received. Future candidates should wonder how he could win when raising and spending money is supposedly so important. Isn’t a huge campaign war chest an absolute necessity to buy time on radio and television, distribute campaign literature and paraphernalia, hire staff, pay for travel and lodging, etc.? The answer to that question is that Trump persuaded voters – and the media concurred – that he was anti-Establishment, that he wasn’t another creature beholden to the ever-present political professionals. Voters who were tired of being taken from Republican to Democrat, then to another Republican or another Democrat, saw something different in the New Yorker who has never held any political office. And they gravitated toward him in state after state. Huge piles of money didn’t make the difference this time. Now that he’s in a one-on-one race with Democrat Hillary Clinton, he will have to spend gobs of money for the final race. His own deep pockets may supply some of the needed cash. And he’ll certainly have to convince independent voters that he’s more than an interesting novelty making a bid for the nation’s highest office. Opponent Clinton has plenty of money and plenty of political experience. But she also has a closet full of skeletons that may turn voters away. Trump’s distance from the Establishment will continue to gain him support from a sizable number. But his penchant for shooting from the hip could turn out to be a negative among many voters. With all of this said, we note that the 2016 primary season taught an important lesson: Money doesn’t necessarily translate to victory. No one knows this better than Jeb Bush and the 15 others who lost to the New York outsider. Growing numbers of the American people are looking for someone who is not part of the increasingly despised Establishment. Will Trump’s record match his rhetoric? The voters will have to see. Ben Carson typifies what’s wonderful about America. Born in 1951 in Detroit and raised along with an older brother by a single mother after her husband abandoned them, he rose from poverty to graduate from Yale University and the University of Michigan Medical School. Subsequent years saw him become a pioneer in the delicate field of neurosurgery. He filled the post of Director of Pediatric Neurosurgery at Maryland’s Johns Hopkins Hospital from 1984 until retirement in 2013. During his highly successful medical career, he received more than 60 honorary doctorate degrees and the Presidential Medal of Freedom. An early leftist Democrat, Carson gravitated toward conservatism and eventually joined the Republican Party. In May 2015, he announced his candidacy for the GOP presidential nomination and appeared along with Donald Trump and 15 others in many of the GOP debates. Never catching fire as a candidate, he withdrew from the race on March 4, 2016, and announced his endorsement of Donald Trump a week later. Given time for a speech at the recent GOP Convention, Carson pointed to Hillary Clinton’s admiration for Saul Alinsky, the Chicago-bred champion of community organizing. Clinton, he noted, had written her Wellesley College thesis praising Alinsky and his political tactics later adopted by leftists. And he pointed to Alinsky’s small book “Rules For Radicals” and its dedicatory citation to “Lucifer” described by the Chicago leftist as “the original radical who gained his own kingdom.” So close to Alinsky was Clinton that he offered her a job after graduation from Wellesley but she declined and went off to law school. Barack Obama later became an Alinsky acolyte. Though absolutely correct about what he justifiably stated about Mrs. Clinton, Carson’s point infuriated CNN panelist Van Jones who, bursting with stage-managed horror, expressed total disdain for Carson’s tying of “Lucifer” to Alinsky – and logically to Hillary Clinton. A former appointee of Barack Obama, Jones was forced to resign as a White House environmental adviser in 2009 because of his leftist radicalism that included involvement with the Marxist group “Standing Together to Organize a Revolutionary Movement” (STORM). Jones also used his prestigious White House post to seek leniency for the killer of a policeman in Philadelphia. Among the members of Congress who successfully called on President Obama to oust Jones from the White House staff was then-Congressman Mike Pence, now the GOP nominee for vice president. Senators Christopher Bond (R-Mo. ), John Cornyn (R-Texas) and others in Congress joined in that successful effort. In his effort to paint Hillary Clinton as one who favors Lucifer more than God and the fundamental roots of America, Carson could also have cited her speech at the 2016 “United Nations Sixth Annual Women in the World Summit.” Before an adoring assemblage of gay, lesbian, bisexual, transgender, and abortion advocates, she said of the American people that their “deep-seated cultural codes, religious beliefs, and structural biases have to be changed.” More Americans should be apprised of that revolutionary urging. Were he still alive, Saul Alinsky would be applauding Clinton, his eager disciple. Carson should be congratulated for pointing to Hillary’s salute to the atheist revolutionary. And Van Jones should become better known, first as a radical disbeliever in America’s fundamental religious and political beliefs, and then someone who shouldn’t be given a platform to express his revolutionary preferences by CNN or any media outlet. Congratulations to Ben Carson for bringing awareness about some of Mrs. Clinton’s extreme leanings and extreme friends to the public.